Why Were Warner Ads in Spalding Guides? Quickly flipping through one of Spalding’s Guides for football shows that these annual guides served two major functions: 1) providing the football community analysis of the previous and upcoming seasons and 2) serving as a catalog of Spalding’s football-related items. Spalding didn’t sell advertising to competitors for placement in these widely read little books. In fact, the only non-Spalding ads I have noticed are those for Walter Camp’s and Pop Warner’s books. Why, one wonders, would ads for just these two outsiders be allowed? For starters, Walter Camp wasn’t really and outsider as, for many years, wrote major pieces for the guides and served as editor of them. As editor, he may have organized the layout of the book including determining what would be included and where it would go in the books. Spalding surely dictated much about the advertising. Ads for Camp’s books may have been partial payment for all the work he did for Spalding or his position with Spalding gave him a favored position that allowed him to buy ad space where others were not allowed. A closer looks at Walter Camp’s book listings reveals that they were probably published by Spalding. That means that Camp’s books were Spalding products that Camp was likely paid to author. But Warner had no special relationship with Spalding as far as we know. 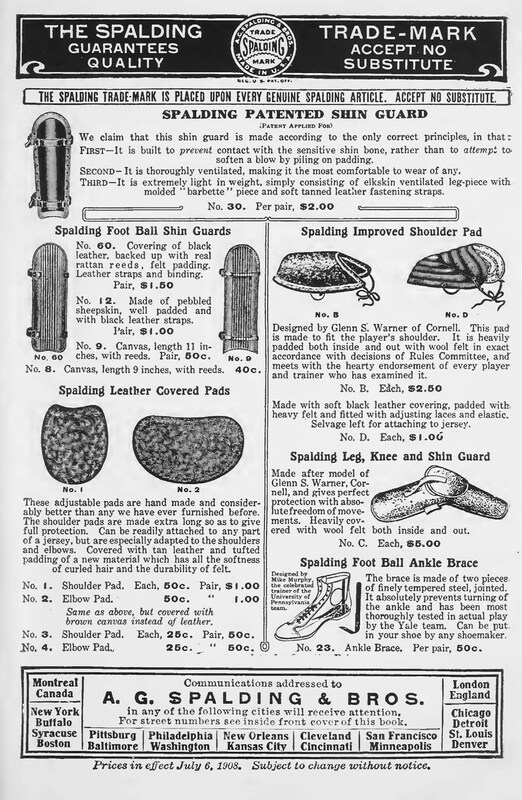 The unnumbered pages in the back of the 1908 Spalding’s Guide include a catalog page that has shin guards at the top. Just below the shin guard ad, in the right hand column, is an ad for “Spalding Improved Shoulder Pad.” Comment about its improvements and over what will be reserved. The first line of ad copy starts, “Designed by Glenn S. Warner of Cornell.” So, Warner has some sort of relationship with Spalding with regard to product development. That could explain why an ad for Warner’s correspondence course and book are included in Spalding Guides. This entry was posted on April 5, 2012 at 11:17 am and is filed under Carlisle Indian School, Football, Pop Warner. You can follow any responses to this entry through the RSS 2.0 feed. You can leave a response, or trackback from your own site.